holding in down dirty, dirty style. explains how he balances his career, family & success. 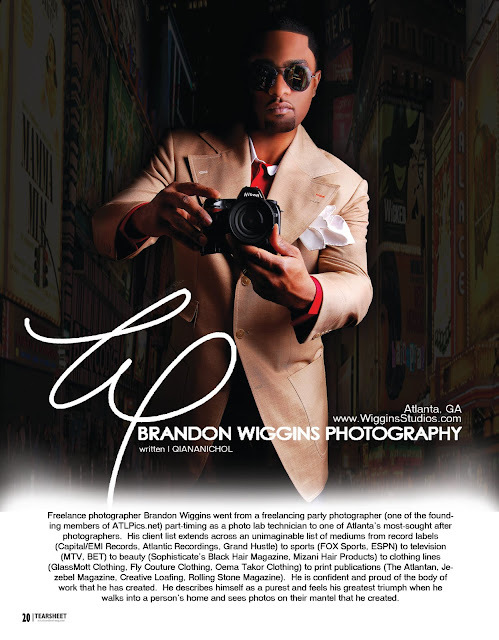 Freelance photographer Brandon Wiggins went from a freelancing party photographer (one of the founding members of ATLPics.net) part-timing as a photo lab technician to one of Atlanta’s most-sought after photographers. 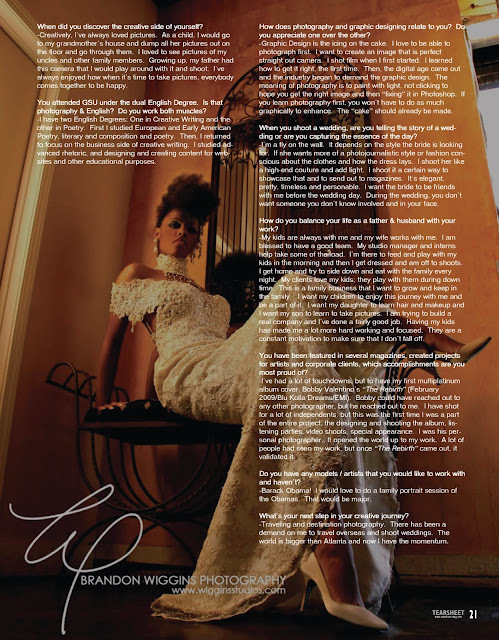 His client list extends across an unimaginable list of mediums from record labels (Capital/EMI Records, Atlantic Recordings, Grand Hustle) to sports (FOX Sports, ESPN) to television (MTV, BET) to beauty (Sophisticate’s Black Hair Magazine, Mizani Hair Products) to clothing lines (GlassMott Clothing, Fly Couture Clothing, Oema Takor Clothing) to print publications (The Atlantan, Jezebel Magazine, Creative Loafing, Rolling Stone Magazine). He is confident and proud of the body of work that he has created. He describes himself as a purest and feels his greatest triumph when he walks into a person’s home and sees photos on their mantel that he created. When did you discover the creative side of yourself? -Creatively, I’ve always loved pictures. As a child, I would go to my grandmother’s house and dump all her pictures out on the floor and go through them. I loved to see pictures of my uncles and other family members. Growing up, my father had this camera that I would play around with it and shoot. I’ve always enjoyed how when it’s time to take pictures, everybody comes together to be happy. You attended GSU under the dual English Degree. Is that photography & English? Do you work both muscles? -I have two English Degrees; One in Creative Writing and the other in Poetry. First I studied European and Early American Poetry, literary and composition and poetry. Then, I returned to focus on the business side of creative writing. I studied advanced rhetoric, and designing and creating content for websites and other educational purposes. How does photography and graphic designing relate to you? Do you appreciate one over the other? -Graphic Design is the icing on the cake. I love to be able to photograph first. I want to create an image that is perfect straight out camera. I shot film when I first started. I learned how to get it right, the first time. Then, the digital age came out and the industry began to demand the graphic design. The meaning of photography is to paint with light, not clicking to hope you get the right image and then “fixing” it in Photoshop. If you learn photography first, you won’t have to do as much graphically to enhance. The “cake” should already be made. When you shoot a wedding, are you telling the story of a wedding or are you capturing the essence of the day? -I’m a fly on the wall. It depends on the style the bride is looking for. If she wants more of a photojournalistic style or fashion conscious about the clothes and how the dress lays. I shoot her like a high-end couture and add light. I shoot it a certain way to showcase that and to send out to magazines. It’s elegant, pretty, timeless and personable. I want the bride to be friends with me before the wedding day. During the wedding, you don’t want someone you don’t know involved and in your face. How do you balance your life as a father & husband with your work? -My kids are always with me and my wife works with me. I am blessed to have a good team. My studio manager and interns help take some of the load. I’m there to feed and play with my kids in the morning and then I get dressed and am off to shoots. I get home and try to side down and eat with the family every night. My clients love my kids; they play with them during down time. This is a family business that I want to grow and keep in the family. I want my children to enjoy this journey with me and be a part of it. I want my daughter to learn hair and makeup and I want my son to learn to take pictures. I am trying to build a real company and I’ve done a fairly good job. Having my kids has made me a lot more hard working and focused. They are a constant motivation to make sure that I don’t fall off. You have been featured in several magazines, created projects for artists and corporate clients, which accomplishments are you most proud of? -I’ve had a lot of touchdowns, but to have my first multiplatinum album cover, Bobby Valentino’s “The Rebirth” (February 2009/Blu Kolla Dreams/EMI). Bobby could have reached out to any other photographer, but he reached out to me. I have shot for a lot of independents, but this was the first time I was a part of the entire project, the designing and shooting the album, listening parties, video shoots, special appearance. I was his personal photographer. It opened the world up to my work. A lot of people had seen my work, but once “The Rebirth” came out, it validated it. Do you have any models / artists that you would like to work with and haven’t? -Barack Obama! I would love to do a family portrait session of the Obamas. That would be major. What’s your next step in your creative journey? -Traveling and destination photography. There has been a demand on me to travel overseas and shoot weddings. The world is bigger than Atlanta and now I have the momentum.